Thanks for your help. I am planning on doing this hike in Mid-May. Great Falls to Cumberland on foot. Any advice? Good advice. The problem I face is that I only have the last two weeks in March to hike. I want to do a thru, but what are my water options at that point? I’m planning on thru-hiking the whole thing in May/June. If anyone wants to join I’d like the company! What are the rules for hikers? We went on a hike today, Saturday of the memorial day weekend. Many bikers were on the path as well and some stayed on the right side but many didn’t, failed to yield right of way to hikers and NONE used horns bells etc. though some called out when approaching us from the rear. I stayed on the left side of the path but my companion disagreed about which side we should stay on. There were many bikers and we had a dog walking too, so I kept him on heal because of some of the bikers’ disregard of us. Hey thanks for the info! I’m planning to solo hike the trail from Cumberland to DC in Sept this year. How many days total did you spend on the trail? I am thinking of of taking my three boys on their first backpacking trip – ages 9, 7 & 7. Thought we would start in Cumberland and end in Hancock and average 10 – 12 miles a day. Do you think that is reasonable for kids that age? Any other thoughts or advice? As someone who has family in Cumberland/Frostburg, you may want to consider doing the opposite direction. There’s a reason they say Cumberland is in the “mountains” of Maryland. It looks like a wide, well maintained trail, does it start in a city? Or do you feel like you are in the wilderness when you do it? Thanks for the guide! I thru-hiked the C&O last September and found your guide useful for prep, and I was especially grateful for it as it seemed to be the only one I could find online for hiking (as opposed to biking). To help remedy that scarcity, I wrote my own guide here (if you’re interested): http://www.riordanfrost.com/travel/hiking-the-co-canal-towpath-advice. Hi Ed, it’s been 9 years since I did my last thru hike on the C&O(2008). Since 1994, I have thru hiked it 8 times. The last time I was on the trail was 2014, when I hiked from Cumberland to Harper’s Ferry, the head south on the Appalachian Trail. I miss the C&O, and I am contemplating doing it again this year, probably starting in April. I spent a lot of time on the C&O, when I lived in Cumberland, and that’s where you could always find me. I usually went and did overnight camping on weekends, anywhere from Evitts Creek Campsite, to the PawPaw Tunnel. One thing I do need to change as far as hiking, is finding shoes that last longer, and easy on the feet. With all the gravel, it ate the bottom of my shoes up, so it caused blistering on the bottom of my feet quite often. I am looking forward to returning to Cumberland to do this again. Thank you. I am taking two grandsons (14 and 12) in April. We will watch the weather and then take appropriate clothing. Your recommendation not to take boots was helpful. Thanks for this helpful advice. 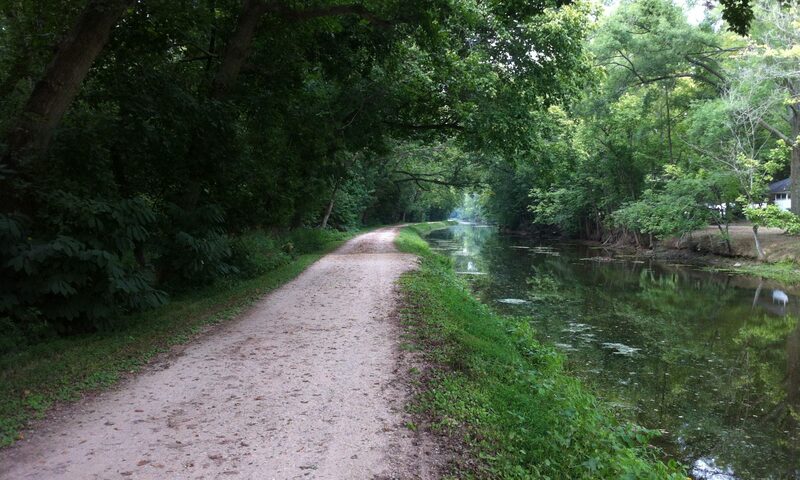 I am slowly easing myself into the idea of C&O Canal trekking. “Hikengripen” made me laugh out loud – thanks ! Thinking of doing the C&O next year. Looking for company ….planning on 8-10 miles a day and using B&Bs. In my 70s hence the lower mileage. I hope you have a great time! Both times we did the entire trail we kept the pace at exactly 20 minute miles, or 3 miles per hour. I actually set a timer for 20 minutes at every mile marker just for fun to see if we could hit the next marker right as the alarm went off. I’d guess with a group like that, 2 miles per hour is probably a better average target while walking. I think you might walk faster than that, but I’m guessing the large group size will mean lots of pauses. That would be a bit less than 5 hours of actual hiking per day leaving plenty of time for breaks and detours. Next PostNext 2017 is on.